Lent is a solemn religious tradition that is observed in many denominations. It begins on Ash Wednesday and covers a period of approximately six weeks before Easter Sunday. During Lent, some Christians choose to give up a habit or behavior as an exercise in prayerful self-denial. Christians who observe Lent typically make a commitment to fast, or to give up something--a habit, a food or drink. Strict observers abstain from eating meat on Fridays, choosing seafood alternatives instead. The goal is to keep food intake smaller and keep it simpler. While abstinence lowers the quality of food, fasting lowers the quantity. The traditional purpose of Lent is to give the believer strength in your spiritual life by weakening the attractions of the sensate pleasures. You don't have to sacrifice flavor as you indulge in both fasting and abstinence during Lent. The Lenten season offers an opportunity to test new seafood and vegetable dishes. 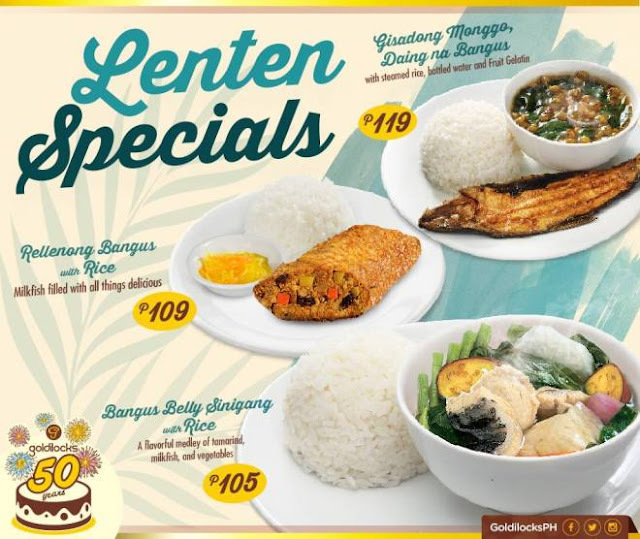 Goldilocks, the country’s number one bakeshop, launched a variety of meals made especially for the Lenten season. Treat your taste buds to the savoury goodness of RELLENONG BANGUS, SARAPINOY GISADONG MONGGO with DAING NA BANGUS, and BANGUS BELLY SINIGANG. All these come with a serving of steaming white rice for as low as P 105. These are available for a limited time at any Goldilocks branch nationwide.